Police say they responded to a report that a woman was suicidal. They say she barricaded herself in her house for several hours, and then came out with a firearm and pointed it at police. Several police vehicles blocked off the area as emergency personnel responded to the woman. 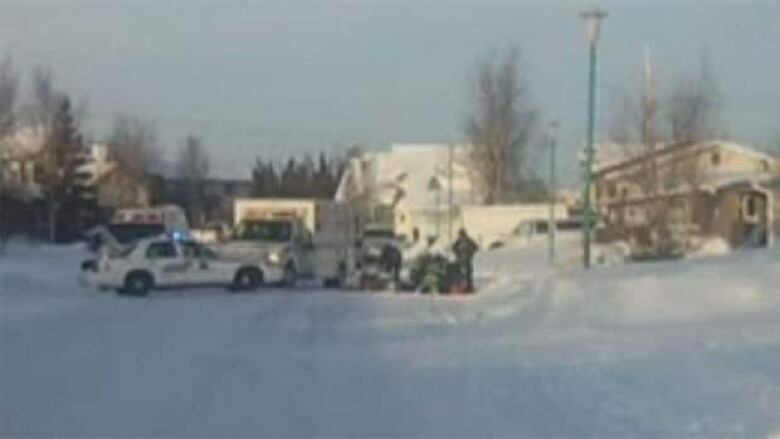 A woman is dead after a shooting in Yellowknife. RCMP responded to a report of a suicidal woman near Dagenais Drive at about 1:30 p.m. MT. Police say she was armed and had barricaded herself inside a house. A crisis negotiator made contact with the woman and spoke with her for several hours. Police say that at about 6 p.m, the woman walked out of the house carrying a long-barreled firearm and pointed it at the officers. RCMP say they told the woman repeatedly to put the weapon down, and when she refused, the police said in a news release that "shots were fired". The woman was taken to hospital but was pronounced dead. Police cordoned off the neighborhood for several hours. Trevor Squires, who lives in the area, said he saw a group of emergency workers crowded around what appeared to be a person lying on the ground on Dagenais Drive. Squires said he also saw an RCMP officer pick up what he says appeared to be a rifle and then stick the rifle in the snow bank. "I saw what appeared to be a rifle to me and I'm not very happy about. It's pretty scary when you get down to it," he said. An external police agency is being asked to conduct an investigation into the shooting.